Nepal is considered one of the least-developed countries in the world. In 2013 it was ranked 157th among 187 countries with respect to the Human Development Index (HDI) and the estimated Gross Domestic Product (GDP) of 2012 was EUR 983.5 per capita. Agriculture forms the mainstay of Nepal’s economy. It contributes about one third to the GDP and is the main source of income for 80 % of the population. The agricultural sector is dominated by smallholders and subsistence farmers, whose production only meets household food requirements for an average of 6 to 8 months. 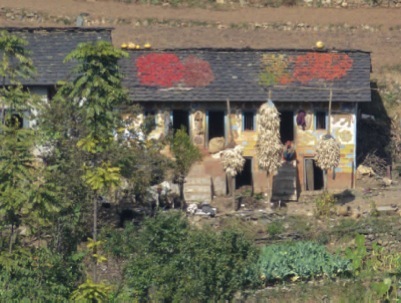 The food security situation is especially serious in hill and mountain areas of Mid- and Far-Western Nepal. Here some 30 % of the communities (Village Development Committees, VDCs) were classified as food insecure in 2012. In the far-western districts of Bajhang and Baitadi cereal production is less than 150 kg per capita, which makes import of staple food from the lowland (terai) and bordering India indispensable. Food import is hampered by a small and unreliable transportation network. Nepal is one of the least accessible countries worldwide, with 83 % of the rural population living further than two kilometres off an all-season road. Lack of road access is responsible for high transportation costs, which makes it ever more difficult for poor households to afford additional food items. The Far Western Region was largely neglected by previous governments and public investments in infrastructure are low. The decade-long Civil War, which ended in 2006, increased the area’s socio-economic marginalisation and there were only slight improvements in recent years. 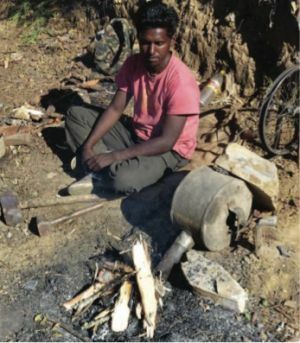 Since the peace agreement was signed, local people face the challenge of integrating ex-Maoist combatants and those returning from exile into their communities. Living conditions are especially serious for dalits (‘untouchables’) and women, who face frequent discrimination and are generally excluded from society. In response to economic hardship many young men migrate away from the area in search of work. In 2011 in both districts more than 43,000 people – about 10 % of the total population – were absent, which puts additional burdens on women. Against this background the German Federal Ministry for Economic Cooperation and Development (BMZ) commissioned the Deutsche Gesellschaft für Internationale Zusammenarbeit (GIZ) to implement the “Improvement of Livelihoods in Rural Areas (ILRA)” project between 2009 and 2013. The overall objective of the project was to improve the livelihoods of poor and marginalised households in 25 VDCs of Baitadi and Bajhang districts. strengthen the capacities of beneficiary groups in terms of social cohesiveness and socio-economic development. A central activity to achieve these objectives was the construction of rural roads, which would serve as “backbones” of socio-economic development in both districts. 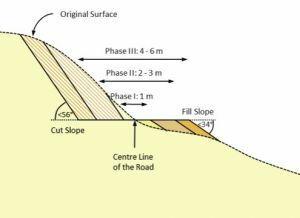 The road construction approach is described in general terms in the “Rural Road Construction Strategy” (see references). This example illustrates the implementation process in Bajhang and Baitadi and provides detailed information and lessons learned. Located in the transition zone between the Middle Hills and the Great Himalayan Range in the western most corner of Nepal, Baitadi and Bajhang are two of the least accessible districts of the country. Due to bad road connections it takes about three days to reach them from the capital of Kathmandu by car. Having reached the districts, travelling does not get easier: Baitadi has only one paved, all-weather road, and the first one in Bajhang is under construction. The majority of the 446,000 inhabitants of Bajhang and Baitadi are thus deprived of reliable access to markets and services. Local people and government authorities identified the lack of roads as the biggest obstacle to improve food and livelihood security and socio-economic development. Therefore ILRA decided to support the construction of two rural roads with a total length of 46 km. A labour-intensive food-/cash-for-work approach was adopted, which offered employment for thousands of beneficiaries. The rice and cash earned by the beneficiaries alleviated food shortages significantly in the short term. In the long term, new basic infrastructure helps to create additional opportunities for economic development. Improved accessibility is only a necessary but never a sufficient condition for socio-economic development. Thus the project implemented a range of complementary side-projects. ILRA supported local communities in improving drinking water and irrigation schemes. It constructed school buildings for formal education and established 35 informal learning centres, the latter provide a forum for basic education and serve to impart knowledge on hygiene, health etc. In learning centres participants discuss social issues like domestic violence or caste discrimination. These centres are useful in bringing about reconciliation in local conflicts and helping people to take their first economic steps. In support of sustainable economic development ILRA introduced new cultivation techniques. It established and trained commercial farming groups that successfully started to gain additional income by cultivating commercially valuable products like chilli, ginger and groundnut. To leverage synergies, ILRA placed great value on cooperation with other donor agencies from the very beginning. 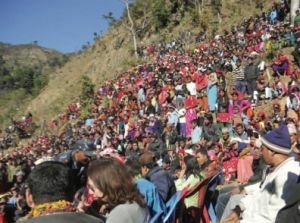 In Baitadi and Bajhang cash- and food-for-work schemes were conducted in collaboration with the World Food Programme (WFP) of the United Nations. Persuaded by the beneficial impacts of the rural road in Bajhang the adjacent VDC of Dahabagar is planning to extend the GIZ-supported road for another 6 km towards its centre. The VDC has already allocated funds and intends to approach the Nepalese Government-run Poverty Alleviation Fund (PAF) for supplementary inputs. GIZ will support the technical survey. Possible districts were identified in consultation with other donors, after analysing secondary data and with the Ministry of Peace and Reconstruction’s consent. Then an assessment mission visited the possible districts. The mission presented the framework of potential project activities to the district government, political parties and civil society in the districts. The District Transportation Master Plans of the districts were consulted. Every district in Nepal has to prepare and regularly update such a plan which shows the greatest demand for transportation infrastructure and gives a rough indication of existing and future road alignments. On the plan the mission team sought to identify a road alignment that coincided with communities with a food deficit. After this GIZ staff conducted a so called ‘walk over survey’. The focus of this survey was partly to find out whether the potential communities would benefit from and were willing to participate in constructing a road. It met local leaders and the potential target groups and conducted focal group discussions. In addition to social considerations, the focus also was on whether the project was technically possible. If the alignment foresaw crossing a large river for example, this would have been deemed financially impossible for this project. The team then presented its findings to the Ministry of Peace and Reconstruction. After considering all the information, two project areas in the far-western districts of Bajhang and Baitadi were chosen. In both cases local government authorities showed great interest in the project strategy and provided all needed information. Independent consultants hired by ILRA conducted a detailed survey, developed the design and estimated the volume of work. The valuable knowledge of local people about disaster preparedness was incorporated. The independent deliberation of these criteria in each of the project areas led to quite different road alignments. In Bajhang the new 16 km long road is located at the valley bottom. Such alignments have the disadvantage that the road is more prone to damage caused by landslides and erosion, because of the vicinity of the river and the concentration of runoff of rainwater in the lower slope sections. In addition, this alignment implied that the road had to be built mostly on agricultural land, which is concentrated on the lower slopes and flat river terraces. However, these disadvantages were outweighed by the potential economic and social impacts: the road connects several villages whose inhabitants clearly benefit directly from enhanced transportation facilities. At the end of the road there is a local service centre, in which government authorities provide health, education and agricultural services to inhabitants of the surrounding areas. Service provision has become much easier after the road was completed as supplies like medicine can now be transported to the distribution point by car and do not have to be carried by porters and mules. In Baitadi the local settlement pattern allowed for a road alignment which follows the ridge top (see Photo 2). Such alignments are usually more stable because cross slopes are moderate and the concentration of rainwater-runoff is less. 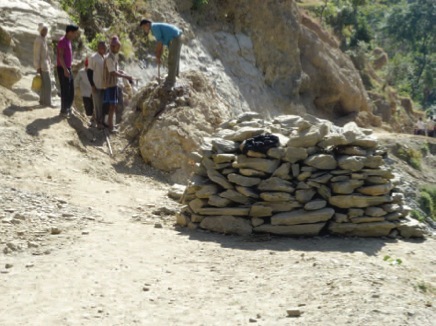 Building a road near the ridge top provokes fewer disputes on land, because agriculture in the middle hills of Nepal is concentrated at the valley bottoms and on the river terraces. 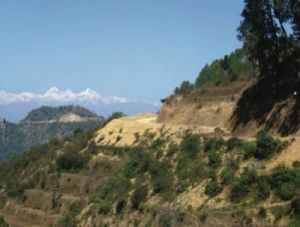 The 30 km long road in Baitadi connects a regionally important bazaar place located at the only paved road of the district with a famous temple near the Indian border. The area around the temple has potential to be developed as a local market centre, which would further increase the economic impact of the road. The Rural Road Construction Strategy foresees a locally-based project team which supports community-based organisations (CBOs) in managing the construction process. 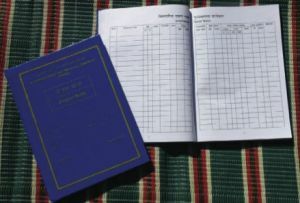 While overall management of financial and human resources and coordination with government authorities and cooperating partners was the responsibility of a central project management unit based in Kathmandu, responsibility for supporting CBOs, managing food- and- cash-for-work schemes, and the supply with tools and materials was transferred to a local project team in each district. Following this approach, the majority of the project staff lived and worked in field offices at the road construction sites. This set-up made it easy for the beneficiaries to contact staff members in the case of any problems. As a result, the project team was always well-informed of the status of the project and could react swiftly to acute conflicts and bottlenecks. The project teams in each district were headed by a district coordinator who was supported in financial issues by accounting staff. The road construction process itself was facilitated by technicians, technical supervisors and social mobilisers. The project technicians were trained civil engineers. Some of them had worked in previous “Green Road” projects and had considerable experience with the construction principles of this approach (see below). Others were recruited in the project area itself and contributed specific knowledge of the local area. The technicians were responsible for technical surveys, work evaluation and the provision of training on construction skills to the workers. Every section of the road had two technical supervisors. These monitored the construction progress regularly and supplied basic technical support. In Bajhang all technical supervisors were female; in Baitadi they were male and female. Social mobilisers had a crucial role in implementing a rural road construction project. They supported CBOs in all management tasks, conducted training and provided the project team with the latest information. They played a central role in facilitating the resolution of conflicts and in maintaining a high level of transparency. Having such important functions in the project implementation, social mobilisers required in-depth training at the beginning of the project and continuous mentoring throughout the project implementation. Social mobilisers worked in close cooperation with local beneficiaries and fulfilled their tasks more efficiently if they were familiar with local conditions, knew key persons in the communities and had a good knowledge of local habits. Therefore ILRA decided to recruit social mobilisers from the project area. This approach had one major disadvantage: members of staff recruited locally were always embedded in their families and other social networks. This sometimes made it difficult for them to maintain a neutral position, which was a crucial prerequisite for supporting conflict resolution. One solution to this problem was to appoint social mobilisers to work in road sections outside their home VDCs. The project had very good experiences with female social mobilisers. But in the rural areas of Nepal female household members are often expected to fulfil a lot of household chores and working outside the house is not always accepted. So it was crucial to get their families on board. In large road construction schemes like the one chosen in Baitadi (30 km) it was helpful to appoint additional social mobilising coordinators. These were experienced social workers who supported several social mobilisers in fulfilling their tasks and served as a direct link to the district coordinator. According to the provisions of the Rural Road Construction Strategy the construction process served as a measure to build long-term organisational capacities in project communities. Thus the management of the construction process and the use and maintenance of new roads were transferred to CBOs. These had been formed by the beneficiaries in a democratic process before the construction began. As a first step the road schemes in Baitadi and Bajhang were divided into 5 and 6 different sections, respectively. These had a length of 5 to 8 km each, depending on the expected labour input. In each section social mobilisers facilitated a meeting of all beneficiaries. During this meeting potential road users elected a User Committee (UC) comprising seven people. UCs were responsible for managing construction works. They appointed workloads to the groups, distributed tools and materials and were involved in the payment procedure and the settling of construction-related conflicts. ILRA made a great effort to enhance the capacity of elected committee members by providing them with management and conflict resolution training. UC members were continuously supported by social mobilisers. The UCs appointed two members each who then represented the UCs in the so called Road Federation Committee. The Committee represented and coordinated all different UCs and dealt with land-related conflicts and injury and death cases. The Committee is the official body that cooperates with the district government in the long run. At the beginning of the implementation phase Worker Groups (WGs) were formed. Supported by social mobilisers and project technicians, UCs divided their respective road section into several subsections for the WGs. Each group consisted of 10 to 15 workers, who were residents of the adjacent VDCs. Each household was allowed to send one member to work. This ensured that a maximum number of households benefitted directly from the road construction. While children below the age of 16 were strictly prohibited to work, the project otherwise provided equal work opportunities for all willing participants, regardless of gender, ethnicity, caste, faith and age. UCs were encouraged to compose WGs in an inclusive manner. In rare cases ILRA supported the formation of women’s groups, which were requested on some occasions (see Box 1). To strengthen the capacities of WGs project technicians and social mobilisers organised training on mass balancing i.e. evening out the road, rock cutting, construction of dry walls, gabion boxes and water management structures, and preventive bio-engineering measures. An estimation of the work volume was conducted in the beginning. Each group knew exactly what they would earn for the work volume in their section. Every year an updated assessment was used as the basis for the contracts with the respective UCs. Altogether 11 UCs in Baitadi and Bajhang managed the work of 475 groups with around 9,000 workers. This immense management task was supported by local supervisors. In consultation with ILRA the UCs appointed one community member each as a local supervisor, who received special training by the project technicians in basic construction and measurement techniques. Local supervisors ensured that workers adhered to the construction principles of the “Green Road Approach”. In addition, they checked that the road followed the right angle and had the expected width. They were also responsible to maintain proper records of the attendance of every single worker. The supervisors were supported by social mobilisers and technicians who visited the construction sites on a daily basis. Technical supervisors and members of the users’ committees received first aid training. They were also given masks for the workers to wear when necessary, stretchers and basic medicines. Constructing a road in mountainous terrain is a challenging task and although ILRA made considerable efforts to ensure the workers’ safety (training, high-quality tools), accidents could not be totally prevented. To prepare for such mishaps, the project established a Social Security and Maintenance Fund (SSMF). To build up the fund, ILRA deposited 1 Nepalese Rupee (1 NPR ≈ 0.9 EUR) for each kilogramme of rice distributed to the workers on a special bank account. This money was used to treat injured workers and to compensate the families of the victims of the few fatal accidents which occurred in Bajhang (2 casualties) and Baitadi (1 casualty). This group insurance gave up to 200,000 NPR to the family of a worker who had a fatal accident. The funds were managed by the Road Federation Committee in collaboration with the district coordinator, who during the project implementation was a signatory of the SSMF. The Road Federation Committee set up clear conditions for the use of its resources. As the name indicated, the fund had a dual function: After the road was finished the remaining resources formed the financial basis for future maintenance works (see Section 4 Maintenance). The Rural Road Construction Strategy followed the provisions of the “Green Road Approach” which was developed by German and Swiss development cooperation in the late 1970s. A “green road” is a fair-weather road for light vehicles only, which is adapted to local environmental conditions and can easily be maintained by local road users. To generate a maximum of local employment opportunities labour-intensive road construction methods (mainly manual work) were adopted rather than machine-based technologies (e.g. excavators). Special attention was paid to minimising environmental damage. Every year an Environment Measure Plan was conducted to consider which construction problems could occur during that year. 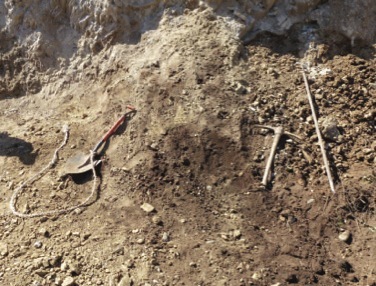 Worker groups were equipped with hammers, chisels, crowbars, and shovels (see Photo 5). Most of these simple tools could be procured locally. The workers were familiar with their handling. They were repaired by local blacksmiths (see Photo 6), which provided additional employment opportunities on the construction sites. 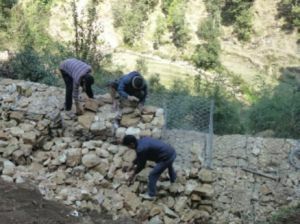 In Bajhang and Baitadi, construction works started in December 2009 and January 2010 respectively. Following the provisions of the Green Road Approach, construction was conducted in three phases which were interrupted by two monsoon periods during which construction was stopped (see Figure 1). The road was allowed to settle down over the monsoon period and slope stability was increased by natural compaction processes. This approach produced less excavation material at any one time, which made disposal management much easier. However, in some sections the project team decided to deviate from this general rule: Where agricultural fields on soft soil were affected, the road was constructed in one go in the third construction phase. Otherwise the landowners would have had to protect the remaining parts of their fields with temporary stone walls after each extension phase. Mass-balancing was of major importance during each construction phase. While conventional road construction approaches often apply box-cutting (i.e. the road is entirely cut into the slope), WGs in Baitadi and Bajhang used a cut-and-fill technique. The centre line of the road was located near the original slope surface and the road was extended by cutting the slope on one side of this line and depositing the material on the other (see Figure 1). Understandably, WGs tended to start working on the soil and soft rock parts within their respective section. But the project team encouraged WGs to start with hard rock parts. This was because otherwise it would have been very difficult to finish the road within a short project time period. While soil and soft rock (e.g. slate) were excavated manually by shovelling, hammering and chiselling, the beneficiaries used the traditional and effective method of “heating and breaking” (see Photo 7) for harder rocks like limestone and dolomite. Only on rare occasions the project team decided to hire an excavator for sections of very hard rock. Excavated material was primarily used to extend the road on the fill slope side. Bigger stones were stockpiled so that they could be reused for stone structures (e.g. gabion and masonry walls) later on (see Photo 8). If possible, any excess material was deposited in a controlled manner within a buffer of 50 to 100 m from the location where it had been excavated. Local supervisors and project technicians took care that no important drainage lines were blocked and no material was deposited on agricultural land. In cases where this could not be prevented, WGs immediately removed the material so that food production was not hampered. Several stone structures were built to protect the road and prevent landslides and erosion (see Figure 2). Wherever material was deposited on slopes steeper than 30° it was protected by toe walls. 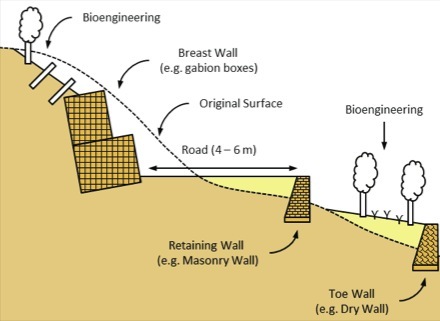 These walls are especially important to protect the foundation of uphill gabion walls from erosion. Other protection structures were retaining walls, stabilising the valley side of the road, and breast walls, supporting the remaining cut slope. In soft soil and rock, walls of gabion boxes were preferred over masonry walls, because they are very flexible and stable. They consist of stacked boxes of wire mesh which are filled with stones by the workers. The stability of these walls highly depends on a proper stone packing and a solid foundation (see Photo 9). WGs were trained in both areas at the beginning of the project. In harder rock sections gabion walls were replaced by masonry walls. Their stability depends to a large extent on proper cement, which itself is dependent on good quality sand. 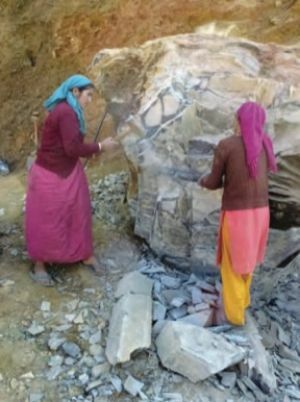 In mountainous areas like Baitadi and Bajhang districts such material is hard to get so that masonry walls were not used often. In cases where only small volumes of material had to be retained (e.g. toe wall), dry walls were used. These consist of stones which are not joined by cement but kept together by their own weight. In both project areas it was not always possible to prevent that the road crossed slope sections which were prone to landslides. In these areas catch drains were built above the sliding zone so that rainwater was diverted away from the slide. In order to prevent erosion damage, existing gullies were blocked by check dams which slow down the rainwater runoff and decrease its erosive power. These prevention structures were complemented by bio-engineering measures. They make use of living plants which reinforce the slope surface through their roots and help control soil erosion and shallow landslides. 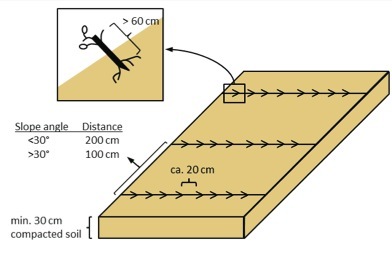 A combination of brush layering (see Figure 3) and planting of grass and trees proved to be very effective. Only local plants which were adapted to local soil and water conditions were chosen. Beneficiaries who are familiar with the local environment gave useful hints. In some locations additional advantages could be gained by using plants which had additional value as fodder trees. In other areas however, it was decided to use plants which are inedible for livestock, so that grazing on instable slopes was prevented. Some local farmers took over the task of growing the saplings in nurseries. The planting of bushes and trees was done during the monsoon period when all other work was stopped and environmental conditions were best for the saplings to take root. The World Food Programme (WFP) hired consultants from the Scott Wilson consultancy to monitor the construction sites at regular intervals, so that their external feedback gave additional input for the quality control. The road construction schemes in Bajhang and Baitadi districts were integrated into a food- and cash-for-work framework. Workers were paid with a combination of cash, rice and pulses and payment was based on accomplished outputs, not on a fixed daily rate. This mode of payment provides an incentive for the workers. It accelerates the construction process and rewards dedicated groups. At regular intervals ILRA field technicians estimated the construction progress of each WG. The accomplished output of the whole group was entered into a work valuation sheet. The form included different types of work (excavation, stone transportation, filling gabion boxes with stones) and different soil/rock types (soil, ordinary rock, medium rock and hard rock) which were evaluated differently. Disadvantages for groups working on hard rock compared to those working on soft soil were thus avoided. Having evaluated the work progress the technicians produced one bill for each WG with the total amount of money, rice and pulses earned by the group and handed it over to the respective UCs. The UCs made a request to WFP for the payments. Then ILRA’s district coordinators gave their consent and WFP released the cheques in presence of ILRA staff in a publicly open event. The UCs handed over the payment (money and coupons) to WGs. The coupons entitled WGs to collect rice and pulses at one of the project warehouses. WGs could decide whether to transport the food themselves or to commission its transportation (mules, porters). Finally, the amount earned was split among the members according to the attendance records. The remuneration for a “daily work norm” was 2 kg of rice, 250 g of pulses and 85 NPR. However, according to their dedication groups could earn more or less than this amount per day. To ensure transparency the amount of all labour payments were made public and monitored by social mobilisers. To further increase transparency all expenses were meticulously written down in a project book which was kept at the road side by the UCs in order to keep a full record. These books were consulted during public audits (see Photo 10). Voluntary land contribution by future road users without compensation by the project is one of the core principles of the Rural Road Construction Strategy. The contribution is compensated indirectly through the increase in value of the remaining land due to road access. This approach increases the feeling of ownership for the road among the landowners along its corridor and reduces construction costs considerably. Therefore at the very beginning of the project beneficiaries in the project areas had been requested to formally agree to this basic rule. At that early stage this agreement was not disputed at all. Once the construction work started, some of the landowners changed their mind and opposed works on their land. Land conflicts usually arose where agricultural land was affected or where existing infrastructure was in danger (see Photo 11). Reluctance to contribute land by just one landowner could jeopardize the whole project. Therefore, settling such conflicts to mutual satisfaction was of the utmost importance. Resolving land-related conflicts and persuading worried landowners of the advantages of the new road was the responsibility of the UCs, the Road Federation Committees and the government authorities. The ILRA project team only supported the conciliation process by facilitating meetings and mediating between different interests. In addition social mobilisers supported UCs in defining clear procedures for developing solutions to conflicts. These were always based on consensus, so that the issues were settled irrevocably. Solutions sometimes included indirect compensation through side-project activities (e.g. provision of a green house, rehabilitation of irrigation infrastructure). 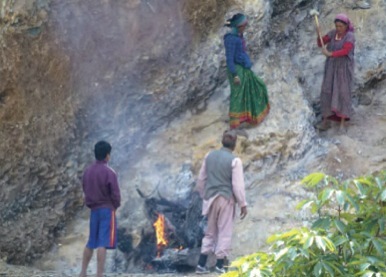 In Bajhang the 16 km long road was officially opened in January 2012 (see Photos 12 and 13) – just two years after the construction work began. In Baitadi the road construction took longer. This was due to its greater length and more challenging geological conditions i.e. large parts of hard rock along the alignment. The project financed the repairs to the road in Bajhang when it got damaged especially during the first rainy season after road completion. To minimise the required maintenance in the first place, the roads are closed for vehicles during the rainy season (June to September) and its use is restricted to light vehicles like jeeps throughout the year. The Rural Road Construction Strategy emphasises ownership and responsibility of local road users. ILRA supported beneficiaries financially and technically in establishing a sustainable maintenance system, which is based on clear rules and responsibilities. Photo 12: In Baitadi the new road was officially opened by the Joint Secretary of the Ministry of Peace and Reconstruction (MoPR) and the country directors of WFP and GIZ. Overall responsibility for the use and maintenance lies with the Road Federation Committee. This is expected to enforce restrictions. In both project areas the Road Federation Committees formed a maintenance sub-committee and reported signs of road damage immediately to this group. After construction work finished, the SSMF was no longer needed to compensate victims of accidents and the remaining money was exclusively earmarked for future repair works. Before the end of the project UCs received training in road maintenance and an engineer made them aware of the more vulnerable parts. The UCs and the Road Federation Committee also took part in bio-engineering training. In a “By-Law Workshop” the Road Federation Committee and the District Development Committee divided up the responsibility for maintenance amongst themselves. On an annual basis the District Development Committee allocates funding for the maintenance of the road. Each section of the road has two paid so called caretakers during the rainy season. By building water channels, small stone structures or by repairing slight damages they try to minimise damage to the road caused by water. Social mobilisers monitored the work of the caretakers during the project duration, after the end of the project the Road Federation took over this task. If the damage is too significant for a caretaker, the Road Federation contacts the District Development Committee. The District Development Committee commissions one of its engineers to assess the damage and pays for the repair. The UCs hire workers. The engineer examines their work before they are paid. In Bajhang, it was decided that vehicle owners would be charged for the use of the road and a simple but efficient tolling system of 50 NPR per vehicle was implemented. The money goes to the SSMF. The road construction schemes created temporary jobs for some 9,000 workers, who received food and cash. This income helped them to ensure food sufficiency for up to an additional three months. It enabled many families to purchase land and livestock, repay debts or save up for a dowry. Transportation costs in Bajhang decreased from 8 to 4 NPR per kilogramme freight. This significantly improved the opportunities of commercial farmers to sell their products on a regional scale. The food security situation of the population of the VDCs along the roads has been improved not only through food provisions during the construction phase, but also due to decreased transportation costs and better market accessibility. Health and agricultural extension services provided by the government in a local service centre in Bajhang were improved through decreased transportation costs for medicine and seeds and better accessibility. Accessibility of the regionally important Shiva temple at the end point of the road in Baitadi was considerably increased. This will certainly increase local pilgrimage tourism along with income opportunities. In both project areas business opportunities along the road improved. Existing market places were extended and there are first signs that new business centres at the endpoints of both roads are being established (see Photo 14). New transportation businesses were started by beneficiaries. In Bajhang for instance, there are currently 8 jeeps and 6 tractors offering regular connections and 2 so called ‘mini Tata vehicles’ being driven along the road on occasion. Beneficiaries reported that discrimination based on ethnicity, caste and gender had decreased significantly in the project area. This was attributed to the social inclusion policy of the project, which provided for mixed worker groups and reduced prejudices. For instance, dalits made up almost one quarter of the participants in the project activities. As this group accounts for only 17 % of the entire population, the project made a significant contribution to their social inclusion. At work dalits took their meals together with their fellow-workers, something that would have been inconceivable before the project began. Women’s self-esteem was especially increased. Many women earned their own income for the first time. They were holding 50 % of all leadership positions in the work groups. This significantly improved their position within the household and within the communities. Conflict resolution capacities were improved in the project areas. This was achieved through training in local dispute solving, the forum of informal Learning Centres that addressed local conflicts and through participants gaining more experience in successfully settling land and other conflicts. The experience of the project staff is a major success factor in implementing a road construction scheme under difficult working conditions. Most ILRA team members had already worked in other “green road” projects across Nepal. Hence, they were already familiar with many of the challenges which arose during project implementation and were able to develop adequate solutions quickly. In view of technical challenges to communication between the teams in the project areas and the Kathmandu-based project management, it was essential to have reliable and independently operating teams in the field, which could be approached by beneficiaries without much difficulty. Social mobilisers have a crucial role in project implementation. They are an important link between beneficiaries and the project management. When trained properly they were able to detect and resolve problems early on. Especially on the 30 km long road construction scheme in Baitadi ILRA had good experiences with additional social mobiliser coordinators, who were able to provide flexible support to social mobilisers. Another crucial role in successful project implementation is played by committed CBOs (UCs, Road Federation Committees). ILRA increased the dedication of CBO members by organising an exchange programme of UC/Road Federation Committee members from Baitadi and Bajhang and those of a previous “green road” project in Rukum District (Mid-Western Nepal). Visiting the former project area, discussing what they saw with experienced members of still functioning CBOs in this area and learning from their good experiences provided new impulses and additional motivation for the committee members in Baitadi and Bajhang. The ILRA project team had good experiences with motivating beneficiaries from the rear sections of the road to run for leadership positions in the Road Federation Committee. It is in their interest to ensure good road maintenance all along the road corridor as damages in the front sections affect them as much as those in the rear sections. Against a background of volatility in food prices, the combined food and cash payments were appropriate for the promotion of food security and the creation of additional assets. The length of employment available should be at least 90 days in a year in order to enable target groups to reinvest cash remuneration in productive assets. However, the temporary employment should not create dependency and therefore be limited. Roads are a necessary but not a sufficient condition for local development. Therefore it is advisable to complement road construction schemes with side projects that focus on agricultural innovations and the rehabilitation and extension of irrigation schemes. The majority of these side projects should be implemented apart from the road corridor so that the different projects do not challenge each other and the impacts of the cash- and food-for-work programmes is spread over a bigger area. Project staff had very good experiences of accompanying road construction with agricultural and off-farm project activities. Sometimes services provided through one of the side projects can be used as an indirect compensation to people who hesitate to contribute their valuable agricultural land to the road construction scheme. For instance, it is possible to give households who were negatively affected by the road plants they would not have had the money to buy. Previously road construction was perceived as a job of contractors with heavy machines. At first some people were reluctant to work on the road manually. But once a few users worked and received rice and cash, people from every settlement came to join the construction work. Often one may have to show that something works and is in the people’s interest before they believe it. In many cases there were disputes related to land, which the people settled by themselves. Therefore training on skills for conflict resolution need to be provided.